Note: This appears as Chapter 6 in Missile Defense 2020: Next Steps for Defending the Homeland. This study has so far examined the policy and strategic context for homeland missile defense, the historical background and basis for today’s architecture, the state of GMD today, and currently planned upgrades. We turn now to additional or alternative options. To protect the homeland, the United States currently relies almost exclusively on the GMD program and associated assets for midcourse intercept of a limited threat set of long-range ballistic missiles. In the future, the U.S. homeland missile defense posture will likely have to expand GMD, but also broaden to include additional programs. In recent years, more advanced missile defense efforts have suffered from underinvestment. For those specifically related to homeland defense, a kind of budgetary valley appeared between 2010 and 2015 (see Figure 6.1). Much of the drop-off around 2009 to 2010 was the result of program cancellations, such as the MKV, ABL, and KEI. The modest uptick in funding for new programs that has occurred since 2014 has been fueled largely by investments in RKV and LRDR. The LRDR, while significant in the capability it will bring, does not represent a major technological advancement but simply an additional S-band radar. RKV also represents a more incremental improvement over the existing EKV, rather than a dramatic advance. One MDA-wide metric for measuring investment in next-generation, “leap-ahead” concepts is Budget Activity 3 within MDA’s broader RDT&E account (Figure 6.2).1 This category, which funds research into less mature but promising technologies, has been subject to a general decline. For many of the options described in this chapter, however, MDA’s research and development budget would require both more stability and more investment. The United States currently has no plans to expand the number of homeland defense interceptors beyond 44 by the end of 2017. Indeed, the number 44 in some ways overstates the effective inventory, since the currently scheduled test regime will bring this number down by 10 percent from 44 to 40 by 2021, and not recover to the full 44 until 2022 or later—assuming, that is, the RKV development, testing, and production program stays on MDA’s ambitious schedule. This decrease in the GBI magazine between 2019 and 2022 leaves much to be desired in the face of North Korea’s current and potential future missile development. Given a shot doctrine of two to four kill vehicles per target, and given multiple targets per missile, an inventory of 40 to 44 interceptors could well be challenged by serial production of North Korean ICBMs. As highlighted by the 2013 report to Congress on Homeland Defense Hedging Policy and Strategy, the most cost-effective near-term option for increasing homeland interceptor capacity would probably be to complete and fill the additionally planned missile fields at Fort Greely.2 The 2013 report noted that these “additional interceptors could be deployed for a lower cost and more quickly” at Fort Greely than at Vandenberg or at an entirely new site. This is due in large part to the preexisting infrastructure at Fort Greely to support additional emplacements, and other environmental and regulatory restrictions. Interceptor expansion of Fort Greely has at least three potential parts. First, with the refurbishment of Missile Field 1, 14 additional silo “sleeves” could be available relatively soon to be completed and filled. Such a step would boost the number of deployed interceptors at Fort Greely from 40 to 54, for a total of 58, including the GBIs at Vandenberg AFB. Second, Missile Field 2 could be expanded from 14 to 20 silos, bringing the number to 60 at Fort Greely and to 64 at both sites. As compared to completing Missile Field 1, this step may require more new construction. 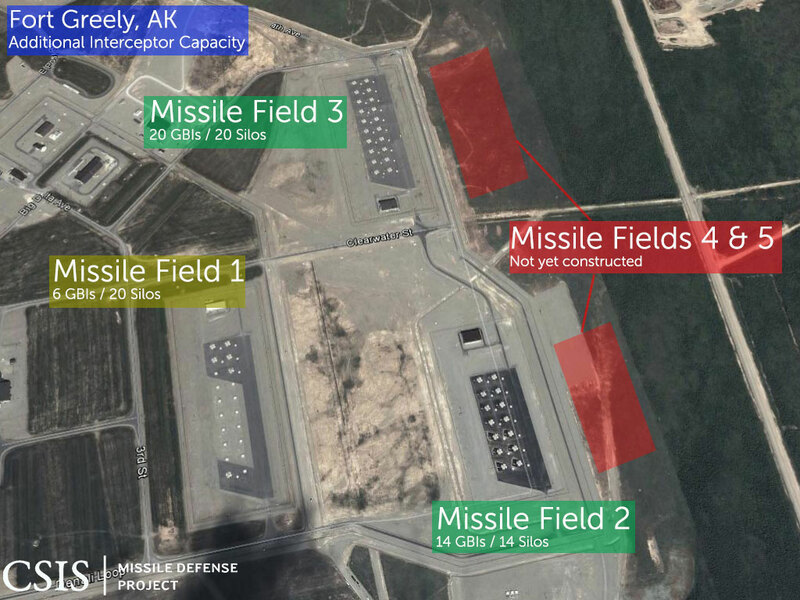 Finally, Fort Greely has areas predesignated for a fourth and fifth missile field of 20 interceptors each.3 An additional 40 silos would bring the full capacity to 104 GBIs between both sites—just above the number envisioned for the expanded Capability-1 architecture proposed by the Clinton administration in 1996 (see Figure 6.3 and Table 6.1). Figure 6.3. Fort Greely Additional Interceptor Capacity. Source: CSIS. “The Secretary of Defense shall conduct a study to evaluate at least three possible additional locations in the United States, selected by the Director of the Missile Defense Agency, that would be best suited for future deployment of an interceptor capable of protecting the homeland against threats from nations such as North Korea and Iran. At least two of such locations shall be on the East Coast of the United States.”] The 2013 National Defense Authorization Act directed the secretary of defense to begin a site selection survey, including Environmental Impact Statements (EIS), for potential location at one of four sites: Fort Drum, New York; the SERE Training Center in Maine; Camp Ravenna, Ohio; and Fort Custer, Michigan. In January 2016, MDA announced that it was no longer considering the SERE Training Center as a candidate site.4 Whereas Fort Greely was evaluated for 100 interceptors in its EIS, the plans for the East Coast site only include 60. Benefits. During the Clinton administration, some advocates of national missile defense recommended that GBIs be located not in Alaska, but in North Dakota, perhaps at the site of the old Safeguard system. Such a location would extend reaction time and provide better protection to the continental United States and the East Coast, both for North Korea and Middle Eastern threats.5 Such a location would probably have made much sense, but was curtailed by both the political mandate for 50-state coverage and the desire to limit deployments to one site in order to remain more or less compliant with the ABM Treaty. Limitations. Defense officials have expressed reservations about an additional GBI site, arguing that it would divert limited resources away from investment in making the existing number of interceptors more reliable. Qualitative improvements to GMD have been neglected in the past, and it would be unfortunate to repeat the pattern. This position does not rule out an additional site located in the continental United States, but is rather an expression of priorities at the margin. Absent direction from Congress and a raised topline to accommodate site construction, its prioritization will likely not occur until at least after MDA has achieved the goals falling under the category of “Robust Homeland Defense.” The relative trade-offs between expanding nominal capacity and location versus greater investment in reliability improvements will, however, need to be reconsidered by the next administration in light of increased North Korean missile activity. 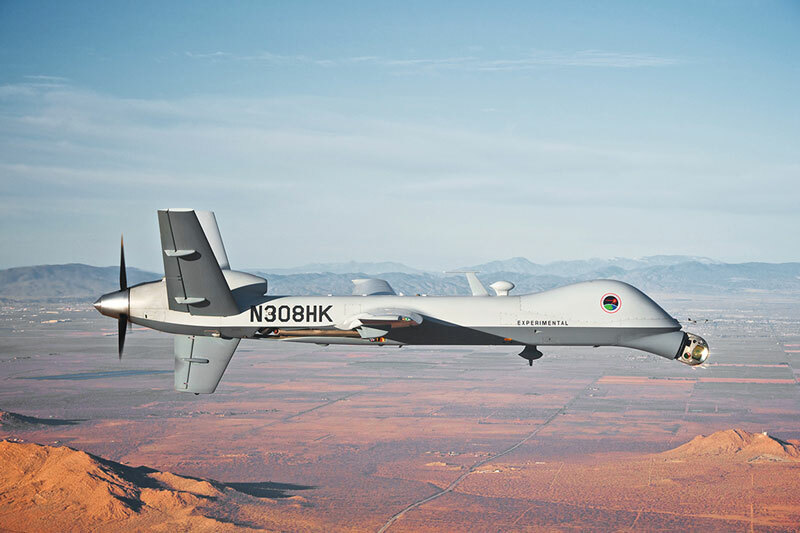 Having the capability to deploy transportable GBIs would allow for an augmentation of interceptor capacity while still maintaining flexibility for responding to threats emanating from other regions. There would still be limitations, however, as to where transportable GBIs could be effectively deployed, given the need for communications and line-of-sight updates from the ground. Such locations would therefore be limited by the availability and presence of both sensor assets and IDTs. A transportable GBI’s flexibility could also be limited by booster configuration. More forward deployments, such as to Europe, might require a two-stage booster, while CONUS deployments might benefit from a three-stage variant. Either system would have considerably less reach and defended area than a GBI, but may offer the corollary advantage of intercept later than even a selectable two-stage GBI. Adding a lower tier to the homeland missile defense system could alleviate some pressure on GMD and add an additional “shoot-look-shoot” option at relatively less cost. Such a lower-tier underlay would not be suited to continental-wide coverage, but could make sense for particular areas, such as Hawaii, Alaska, Guam, or other selected locations. Certain regions or sites could well merit additional defense, such as cities, the National Capital Region, or strategic assets. Such an underlay would not be a replacement for GMD but rather an augmentation. As discussed in Chapter 4, the three-stage GBI booster configuration requires relatively early launch, both due to the slower speed of the heavier three-stage booster and the requirement to burn out all three booster stages before the EKV can be deployed. This in turn constrains the ability to fire a second round of interceptors should the first attempt fail. The two-stage/three-stage selectable booster under development attempts to address this issue, but the interceptor would still carry dead weight when in two-stage mode. Some faster interceptor, either a simple two-stage GBI or perhaps a new and more energetic booster drawing on research from KEI efforts or continued block development of the Standard Missile, could be the basis for a comparatively faster and cheaper interceptor.15 Since faster boosters can be fired later, they increase the time that can be spent on discrimination. Such an interceptor could have the benefit of full or near-full CONUS coverage, while providing a shoot-look-shoot option. The 2012 NAS study recommended a booster with a burnout velocity of six kilometers per second.16 A newer and faster GBI booster could in principle be designed to benefit from more energetic solid fuel, strap-on boosters, or even a liquid fueled stage. MDA’s chartered mission is to develop and deploy defenses against “enemy ballistic missiles in all phases of flight,” but recent efforts have focused on midcourse intercept to the near exclusion of the boost phase. Engaging missiles while their engines are still burning holds the promise of preempting the deployment of post-boost vehicles, reentry vehicles, and countermeasures, thereby avoiding the midcourse discrimination problem. During the boost phase, the missile remains in one piece, making it easier to identify and target. The missile’s body is also weaker than the insulated and shielded reentry vehicle. Even a limited boost phase layer could assist with “thinning the herd” and disrupting structured attacks.17 Boost-phase defense also has the advantage of defeating a threat missile as far away from the U.S. homeland as possible, potentially over the enemy’s own territory. The compressed timeline between ignition and burnout, however, makes the task challenging. Advanced ICBM and SLBM programs are designed to have an especially short boost period. The KEI program was one attempt to kinetically destroy missiles in their ascent phase, but was challenged by the need for near instantaneous reaction time and the difficulty of getting close enough to an inland launch site. Directed energy systems could help mitigate this short time window. Deputy Secretary of Defense Robert Work has remarked that “the first aspect of the third offset strategy is to win a guided munitions salvo competition.” He added, though, that the best way to accomplish this may not be by using kinetic interceptors, insisting, “It’s got to be something else.”18 Kinetic interceptors are comparatively expensive, and missile defense batteries and ships can only carry so many missiles before they run out. Although these programs represented technological advances, the size of the platforms, the operational constraints and challenges, the focus on chemical lasers, and cost considerations made these systems less practical for actual operations. Other directed energy programs under way include the Air Force’s Demonstrator Laser Weapon System (DLWS), the Army’s truck-mounted High Energy Laser-Mobile Demonstrator (HEL-MD), and the Navy’s Laser Weapon System (LaWS). These demonstrators have shown the ability to generate tens of kilowatts at short ranges. Significant increases in transmitted power, expanded range, and miniaturization will be required before these prototypes can be put onto a UAV and tested against boosting missiles. Specifically, this will involve increasing from hundreds of kWs to a megawattplus class laser, improved beam stabilization, and higher altitude UAVs. This trade-off between increased power and size is measured in kilograms per kilowatt. The ABL had some 55 kilograms of weight per kilowatt (kg/kW). The DPALS is said to be around 35 kg/kW. MDA’s stated goal is 2 kg/kW. A UAV-borne laser would need a great deal of power to hit targets from a standoff range. Space and energy come at a premium onboard a UAV. These constraints create a trade-off between range, altitude, and power. Unless and until this power-to-weight ratio is achieved, the applications will be relatively more limited. While North Korea’s proximity to international waters and the trajectory of its ballistic missiles toward the United States would make the concept of operations especially well suited to this threat, its application may be harder for missiles launched further away or inland, such as from Iran. Although directed energy could one day make interceptors obsolete, that day is likely still far away. For the foreseeable future, missile defenses are likely to rely on chemically powered rockets carrying kinetic kill vehicles to defeat other chemically powered rockets. Space-based interceptors were a key component of SDI and GPALS. The concept evolved from garages of space-based interceptors into the concept of individual Brilliant Pebbles and eventually was adopted as part of the GPALS architecture before getting cancelled in 1993. The debate over the feasibility and utility of space-based interceptors continues to this day. The 2017 Defense Authorization Act contained a provision calling on MDA to “commence coordination and activities associated with research, development, test and evaluation” of a space-based ballistic missile intercept and defeat layer.31 Over the last decade, MDA has had occasional requests for a “space test bed” budget line item to research the possibility of a boost-phase intercept layer in space. MDA apparently canceled the program in 2009.32 The 2009 Defense Appropriations Act directed a study on the issue, which was conducted by the Institute for Defense Analyses (IDA) in 2011.33 IDA reportedly concluded that “the technology maturity exists such that the space-based interceptor layer that was considered in this study could be developed within ten years,” while conceding launch costs would be a major limitation.34 Given the current absence of a space test bed or other serious consideration currently under way, it remains an open question what twenty-first-century possibilities might be for a smaller, Brilliant Pebbles–like constellation. Benefits. As a first layer of protection, a space interceptor overlay could augment and supplement GMD by defeating limited threats before their midcourse phase, reducing the number of targets requiring midcourse interception. Such a constellation could be part of a layered defense architecture and would have the role of thinning salvos for subsequent intercept by other terrestrial elements of the system, especially against missiles launched from nations with deeper interiors. Technological advances since the late 1980s and early 1990s might also allow for lower weight, cheaper, and more reliable interceptors.35 Lighter kill vehicles and fuel would also affect launch costs. Limitations. At the same time, significant hurdles still remain, including launch costs. Due to the natural orbital motions of a satellite and the fact it would be on station for a given threat for only a fraction of its orbit, a significant number of parallel orbits could be required to intercept salvo attacks.36 The cost of procuring and launching a sufficiently large constellation would also not be insignificant. In April 2016, MDA director Syring expressed “serious concerns about the technical feasibility of interceptors in space.”37 Russia and China have also both tested various anti-satellite and counterspace weapons that would challenge the survivability of space-based interceptors. In recent years, MDA has emphasized the serious need to address tracking and discrimination shortfalls of the BMDS for homeland missile defense. Advancements include the deployment of an additional TPY-2 radar in Japan for early tracking of missiles from North Korea, completing the integration of Early Warning Radars into the BMDS, and breaking ground on the LRDR in Alaska. These additional ground-based radars afford much needed capability, but overcoming the discrimination problem especially will require greater variation in sensor types and locations. Future space-based tracking constellations could perform a number of functions, including kill assessment and midcourse discrimination. MDA officials have noted that for any future system for missile tracking and discrimination, they would likely work more closely with the Air Force and other Defense Department agencies.40 Should the development of space-based tracking and discrimination become reinvigorated, several options could be considered. Limitations. Space-based tracking also comes with a unique set of challenges. The primary hurdle is the high cost of launching satellites into orbit, which is exacerbated by the size of the constellations required to provide persistent and complete coverage of the earth’s surface. The relatively high cost of a space-based option like PTSS in comparison to terrestrial alternatives led the NAS report to conclude that the lifecycle costs of the system outweighed the additional sensor capabilities it could have provided.44 Space-based tracking systems are also difficult to repair and maintain, driving up the cost over time. Space-based sensors suffer from additional vulnerability to ASATs that use technology similar to the ballistic missiles that they are trying to detect. Larger constellations could acquire resilience through numbers and dispersion. To offset costs, a number of approaches are being considered for the future. MDA’s C4ISR program executive Richard Ritter has suggested that hosted or shared payloads across Service missions would not only reduce costs from MDA’s perspective, but also help with survivability by distributing the capabilities across satellites, making each a less lucrative target for adversaries.45 The model of commercial hosting forwarded by the Space-based Kill Assessment program promises another way to defray launch costs, though it is unclear that commercial hosts can support the kinds of payloads required for larger missions. Past Suborbital and Near-Space Sensor Experiments. The concept of high-altitude tracking and discrimination is not new, and the United States has conducted several experiments on air-based platforms in suborbital space, which could provide some foundations for continue concept exploration. One such experimental program, the Queen Match, sought to replace Cobra Ball aircraft in monitoring Soviet missile launches in eastern Siberia. Rather than an aircraft, an Aries rocket with a payload of sensors would be launched in tandem with a Soviet missile launch to gather discrimination data. The program suffered a failed launch during its first test in 1986, but was successfully tested in 1989. The program was canceled in 1991 after the collapse of the Soviet Union. Among the recommendations from a 2012 report from the National Academy of Sciences was the proposal to increase the covered area of high-resolution X-band radars by deploying dual-emplaced TPY-2 radars, stacked atop one another. This configuration would extend the range of the TPY-2 radars by allowing both a wider field of view and greater possibilities to focus the energy of one or the other radar in a particular place. NAS recommended that stacked TPY-2s should be colocated with certain UEWR locations, particularly at Cape Cod, Thule, and Fylingdales, and mounted on a rotating azimuth turntable for 360-degree coverage. They would be supplemented by an additional stacked TPY-2 radar at Clear, Alaska. The Long Range Discrimination Radar under construction in Clear, Alaska, will do much to fill in radar coverage gaps along likely ballistic missile flight paths from North Korea, but some gaps will remain, particularly in the early midcourse phase over the northern Pacific Ocean and over Hawaii. Currently, this role is filled by forward-based TPY-2 radars in Japan and SPY-1 radars onboard Aegis BMD ships. However, these systems have limitations in the length of time that they can hold a track (TPY-2) and a relatively short range and lack of persistence (SPY-1). This gap has inspired MDA’s interest in the potential deployment of another Medium Range Discrimination Radar (MRDR), likely to be based in Hawaii, as Hawaii would fall outside of LRDR’s coverage. In February 2016, MDA issued a solicitation for information “to determine industry interest and capability for development, installation, and initial operations/sustainment of a land-based Medium Range BMD Sensor Alternatives for Enhanced Defense of Hawaii concept,” with an aim to “expand the persistent midcourse and terminal . . . discrimination capability . . . to defend the United States from ballistic missile attacks.”52 One potential option for this effort would be to simply operationalize the SPY-1 radar currently emplaced at the Pacific Missile Range Facility as part of the Aegis Ashore test bed. Such concepts apply directly to homeland missile defense as well. If it can be done reliably, defeating a North Korean missile on its mobile launcher or during its manufacturing contributes to lessening the burden on GBIs or other active defenses. Both Deputy Secretary of Defense Work and Undersecretary Kendall have championed the use of electronic warfare as a means to disrupt adversary precision-guided munitions, undermining their accuracy and reducing the number of required interceptors to defend a certain target.57 Others have discussed the potential value of cyber tools to complicate the launch process. One difficulty, of course, is the challenge of knowing reliably in advance whether the efforts were successful. Active missile defenses have always been considered in light of other means to quiet a missile launcher, but represent an insurance policy should those efforts fail. Finally, there are kinetic means to destroy missiles on launch pads, comparable to the longstanding Air Force doctrine to destroy enemy aircraft on the ground.58 Early historical analogies include attempts by the Royal Air Force and the U.S. Army Air Corps to destroy V-2 rockets at their launch sites before they could be launched against London. Just as boost-phase missile defenses can thin the herd and mitigate the task for subsequent midcourse intercept, so too should left and right of launch be seen as complementary parts of a “layered defense.” Attacking “archers” left of launch reduces the number of “arrows” that missile defense systems must contend with. Strikes and jamming can also reduce or degrade an adversary’s command and control and logistics capabilities, potentially reducing the capacity to fire missiles even if inventory remains. Left of launch also conserves interceptors by leaving them as a defense of last resort, and improves their effectiveness by limiting the threats to the system. As the U.S. military discovered in Operation Desert Storm, Scud hunting is difficult even in an open desert and with complete air superiority.60 In the context of homeland ballistic missile defense, left of launch capabilities would likely require large-scale offensive operations against enemy missile silos and possible Transporter Erector Launcher (TEL) locations with ballistic missiles. The United States homeland missile defense currently depends almost exclusively on GMD for exoatmospheric midcourse intercept of a quite limited number of long-range missiles from certain quarters of the world. Relatively little effort exists for boost-phase intercept, directed energy, space sensor or interceptor layers, and homeland cruise missile defense. In sum, today’s homeland missile defenses remain too limited. As missile threats to the homeland continue to evolve, a broader and more comprehensive approach and posture may be required. The options and analysis in this chapter represent part of a menu that future policymakers may find useful to consider. 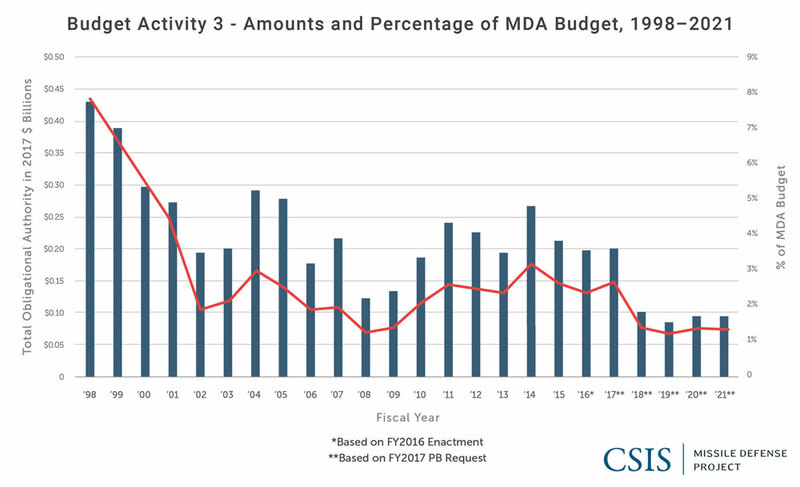 The currently planned enhancements likely account for what MDA will be capable of achieving, assuming the current budgetary topline remains more or less steady. An increase in the topline budget for missile defense would be necessary for additional steps, as well as buy-in from Combatant Commands to support their operational aspects. This will not come easy if overall defense expenditures continue to stagnate. As the Donald J. Trump administration reviews and formulates its national security policies, the strategy, policies, and programs relating to missile defense will also require new scrutiny. 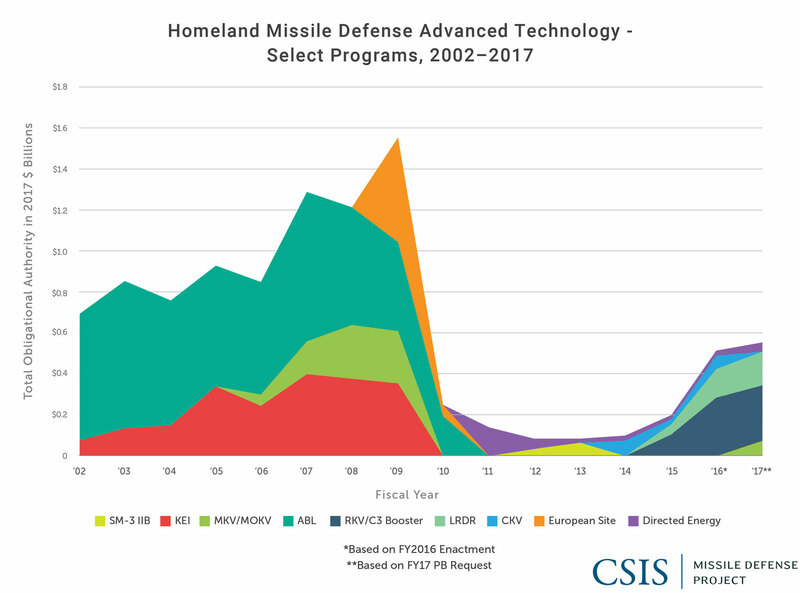 Assuming some degree of constancy about the strategic utility of missile defenses, there seems little doubt that GMD and related programs will continue in some form, and likely expand. Significantly more can be done to improve on the capacity, capability, and reliability of today’s homeland missile defenses. Missile Defense Project, "Future Options," Missile Threat, Center for Strategic and International Studies, April 7, 2017, last modified June 15, 2018, https://missilethreat.csis.org/future-options/. Budget Activity 3 is defined as “efforts necessary to evaluate integrated technologies, representative modes, or prototype systems in a high fidelity and realistic operating environment.” U.S. Department of Defense, “Research, Development, Test, and Evaluation Appropriations,” chap. 5 in DoD Financial Management Regulation, vol. 2B, 5-2. U.S. Department of Defense, “Homeland Defense Hedging Policy and Strategy” (report to Congress, June 2013), 4. The Environmental Impact Statement (EIS) for the site was tailored to 100 interceptors, so such a growth should not incur any unexpected additional delays. Office of the Secretary of Defense, “Notice of Availability of the National Missile Defense Deployment Final Environmental Impact Statement,” Federal Register 65, no. 242 (December 15, 2000): 78475. Missile Defense Agency, “SERE East Designated as Alternative Considered but Not Carried Forward,” MDA news release, January 15, 2016, https://mda.mil/news/16news0001.html. James M. Lindsay and Michael E. O’Hanlon, Defending America: The Case for Limited National Missile Defense (Washington, DC: Brookings Institution, 2004), 24. James D. Syring, “Fiscal Year 2015 National Defense Authorization Budget Request for Missile Defense Programs” (statement before the House of Representatives Armed Services Committee, Strategic Forces Subcommittee, March 25, 2014). General Charles H. Jacoby Jr., Commander, U.S. Northern Command, and Commander, North American Aerospace Defense Command (statement on U.S. European Command, U.S. Northern Command, and U.S. Southern Command, hearing before the Senate Committee on Armed Services, 113th Cong., 1st sess., March 19, 2013). Department of Defense, “Homeland Defense Hedging Policy and Strategy,” 5. Committee on an Assessment of Concepts and Systems for U.S. Boost-Phase Missile Defense in Comparison to Other Alternatives, Division on Engineering and Physical Science, National Research Council, Making Sense of Ballistic Missile Defense: An Assessment of Concepts and Systems for U.S. Boost-Phase Missile Defense in Comparison to Other Alternatives (Washington, DC: National Academies Press, 2012), 85. Brian McKeon, “Fiscal Year 2016 National Defense Authorization Budget Request for Missile Defense Programs” (statement before the House of Representatives Armed Services Committee, Strategic Forces Subcommittee, March 19, 2015). Jim Wolf, “Boeing Floats New Anti-missile Idea for Europe,” Reuters, August 20, 2009, http://www.reuters.com/article/idUSB327847. National Defense Authorization Act for Fiscal Year 2017, H.R. Rep. 114-328, Conference Report to Accompany S.2943, Sec.1694 (2015–2016). James Walker, Lewis Bernstein, and Sharon Lang, Seize the High Ground: The U.S. Army in Space and Missile Defense (Huntsville, AL: U.S. Army Space and Missile Defense Command, 2003), 64. In fact, development of THAAD was constrained for a period of time to limit its ability to counter longer-range ballistic missiles, so as not to run afoul of the ABM Treaty. “THAAD Cleared for ABM Treaty Compliance, Kaminski Says,” Aerospace Daily and Defense Report, October 1, 1996, http://aviationweek.com/awin/thaad-cleared-abm-treaty-compliance-kaminski-says. Making Sense of Ballistic Missile Defense, 146. Ole Knudson, “MDA and the Color of Money” (speech, Center for Strategic and International Studies, Washington DC, July 29, 2015). Sydney J. Freedberg Jr., “Work Elevates Electronic Warfare, Eye on Missile Defense,” Breaking Defense, March 17, 2015, http://breakingdefense.com/2015/03/raid-breaker-work-elevates-electronic-warfare-eye-on-missile-defense/. Missile Defense Agency, “Airborne Laser Test Bed Successful in Lethal Intercept Experiment,” MDA news release, February 11, 2010. James D. Syring, “The Future of Ballistic Missile Defense” (slide presentation, 2015 Space and Missile Defense Symposium, Huntsville, AL, August 12, 2015), slide 14. Syring, “The Future of Ballistic Missile Defense,” slide 20. James D. Syring, “Ballistic Missile Defense Policies and Programs” (statement before the Senate Armed Services Committee, Strategic Forces Subcommittee, April 2, 2014), 21. Syring, “The Missile Defeat Posture and Strategy of the United States—The FY17 President’s Budget Request,” April 14, 2016. Syring, “The Future of Ballistic Missile Defense,” slides 16–19. Missile Defense Agency, “Boost Phase Missile Defense Options,” MDA news release, January 3, 2014. Syring, “The Future of Ballistic Missile Defense,” slide 22. Kenneth E. Todorov, “Missile Defense: Getting to the Elusive Right Side of the Cost Curve,” Center for Strategic and International Studies, April 8, 2016. Sydney J. Freedberg Jr., “Return of the ABL? Missile Defense Agency Works on Laser Drone,” Breaking Defense, August 17, 2015, http://breakingdefense.com/2015/08/return-of-the-abl-missile-defense-agency-works-on-laser-drone/. National Defense Authorization Act for Fiscal Year 2017, Conference Report to Accompany S.2943, Sec. 1683, 629. Making Sense of Ballistic Missile Defense, 38. Jim Wolf, “U.S. to Study Possible Space-based Defense,” Reuters, October 17, 2008, http://www.reuters.com/article/us-missiles-usa-space-idUSTRE49H05Y20081018. “Space Base Interceptor (SBI) Element of Ballistic Missile Defense: Review of 2011 SBI Report,” Institute for Defense Analyses, James D. Thorne, February 29, 2016, quoted in Rebeccah L. Heinrichs, Space and the Right to Self Defense (Washington, DC: Hudson Institute, 2016), 22. Independent Working Group, Missile Defense, the Space Relationship, and the Twenty-First Century (Washington, DC: Institute for Foreign Policy Analysis, 2008), 38. Making Sense of Ballistic Missile Defense, 58, 71. Mike Gruss, “MDA Study Could Eventually Lead to Additional Missile-tracking Satellites,” SpaceNews, June 8, 2015, http://spacenews.com/mda-study-could-eventually-lead-to-additional-missile-tracking-satellites/#sthash.RHFLU7bD.Iqf3sth8.dpuf. Steven Lambakis, The Future of Homeland Missile Defenses (Fairfax, VA: National Institute Press, 2014), 53. Steven Lambakis, On the Edge of Earth: The Future of American Space Power (Lexington: University Press of Kentucky, 2001), 79. Making Sense of Ballistic Missile Defense, 119–120. Richard Ritter, “Congressional Roundtable on Future Missile Defense” (speech, MDAA Congressional Roundtable, Capitol Visitors Center, Washington, DC, July 30, 2015). Bill Carey, “Missile Agency is First Phantom Eye Payload Customer,” AINonline, June 11, 2013, http://www.ainonline.com/aviation-news/defense/2013-06-11/missile-agency-first-phantom-eye-payload-customer. James D. Syring, “Hearing on the National Defense Authorization Act for Fiscal Year 2016 and Oversight of Previously Authorized Programs” (statement before the House of Representatives Armed Services Committee, Strategic Forces Subcommittee, March 19, 2015). Walker, Bernstein, and Lang, Seize the High Ground, 196, 219. Katie Walter, “A View to a Kill,” Lawrence Livermore National Laboratory Science & Technology Review (November 2002): 19–21. Missile Defense Agency, Medium Range Ballistic Missile Defense (BMD) Sensor Alternatives for Enhanced Defense of Hawaii (request for information HQ0147-15-R-0003, Missile Defense Agency, February 10, 2015). Jonathan W. Greenert and Raymond T. Odierno, “Adjusting the Ballistic Missile Defense Strategy,” Memorandum, November 5, 2014. Richard Formica, “Full Spectrum Missile Defense” (speech, Center for Strategic and International Studies, Washington, DC, December 4, 2015). Former MDA deputy director Kenneth Todorov emphasized that “the first thing we’ve got to do is advance the conversation and sort of come to some common understandings on what these things really mean.” Kenneth Todorov, “Full Spectrum Missile Defense” (speech, Center for Strategic and International Studies, Washington, DC, December 4, 2015). Sydney J. Freedberg Jr., “Army Explores New Missile Defense Options,” Breaking Defense, February 18, 2015, http://breakingdefense.com/2015/02/army-explores-new-missile-defense-options/. U.S. War Department, Command and Employment of Air Power, FM-100-20 (Washington, DC: U.S. Government Printing Office, 1943), 6. Sydney J. Freedberg Jr., “Joint Staff Studies New Options for Missile Defense,” Breaking Defense, September 16, 2015, http://breakingdefense.com/2015/09/joint-staff-studies-new-options-for-missile-defense/. William Rosenau, Special Operations Forces and Elusive Enemy Ground Targets: Lessons from Vietnam and the Persian Gulf War (Santa Monica, CA: RAND, 2001). Archer Macy, “Full Spectrum Missile Defense” (speech, Center for Strategic and International Studies, Washington, DC, December 4, 2015). National Defense Authorization Act for Fiscal Year 2017, Conference Report to Accompany S.2943, Sec.1684, 629.